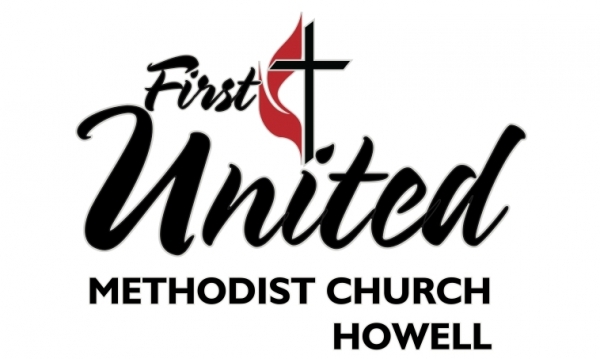 First United Methodist Church – Howell | Simoni Systems, Inc.
During a recent sanctuary remodel FUMC Howell made the decision to incorporate video into their sanctuary. 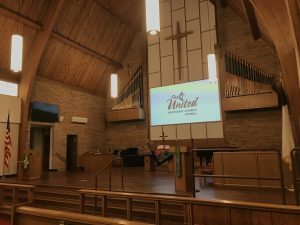 The church knew they wanted to keep the video screen as inconspicuous as possible, to achieve this they decided to project onto a special organ chamber cloth. For video projection a Panasonic Solid Shine Laser Projector was chosen. The laser projector offers 20,000 hours of maintenance free operation allowing the projector to be housed on a high platform keeping it out of sight. 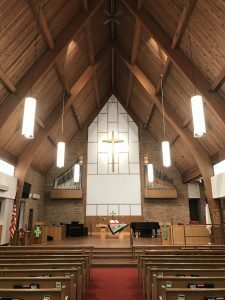 A Sharp Commercial Display was added in the chancel area as a confidence monitor for the adjacent choir and pastor. An Atlona CLSO video switcher was chosen for video switching between a worship aide computer input, a new Denon Professional DVD player as well as an Atlona HDMI/USB-C input plate located on stage in a recessed floor box. All video control is provided by an Atlona Velocity control system. The control system provides power on/off control and video switching. This allows system operators to turn on both video displays with the touch of a button. Controls can be accessed via an iPad app, web browser or iPhone.